Watch your step; the floor in this barside Pool is wet and slippery. Usually the seals are alone in here, but sometimes people will sneak into the sauna for a refreshing steaming. Try not to drown in here. If the possibility of drowning isn't your thing, you could pretend to get a suntan. You can even put on pretend-sunglasses! The APC for this room is located in the maintenance area below. The power is supplied via a cable in the same maintenance area. Mind the floor in here; it's wet and slippery. Usually the seals are alone in this Pool below the Gym, but sometimes people will sneak into the sauna for a refreshing steaming. Pay attention if the engineers scream on the radio, the engine can and will be vented to the sauna. There's a tanning bed imported straight from Space Hawaii here, where you can get a fashionable full-body tan that'll change your entire skin tone, from ghastly-pale white to pitch-under-a-full-moon black and all the browns and peachy colors in-between. You can also outfit it with custom-made light tubes from the Nano-Fabricator to get unique neon-color tones. Just crowbar the tanning bed to dislodge the light tubes and put the new ones in. There is no vent. It's probably pretty humid in there. The APC for this room is in the maintenance tunnel on the left. Watch your step when you're in the Pool below the Gym. The floor's all wet and slippery. Usually the seals are alone in here with Tanhony the monkey and the space seagull, but occasionally people will sneak into the sauna for a refreshing steaming. While this place is uncomfortably close to the engine, you need not watch out for engineers screaming over the radio, since this place gets its steam from the Laundry Room. The Gym and Pool on the NSS Clarion have settled their differences and have become one as the Fitness Center. 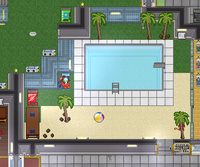 In this way, you can go workout or shoot some hoops after a nice little swim in the pool, or whatever your little spaceperson does in the water. Mind the floor in here; it's wet and slippery. The space seals and the space walrus leader here are usually alone in this rather drearily-lit room near the Crew Quarters, but you may occasionally see some unfortunate fool who's been on fire trying to take a dip in here or some amateur plumber trying to replace the pool water with something amusing. There's also a little wooden space sauna room here, which gets its "steam" via a connecter port in the maintenance tunnel left of it. Since this station is powered by singularity emissions, you don't have to worry about Engineers redirecting excess hot loop gas to the sauna. Not that it prevents enterprising plasma engineers from making this place into a burn chamber. There is no vent. It'd probably get clogged with mildew or whatever if there was. Mind the floor, it's wet and sandy. If you'd rather visit the beach than hike through a forest, the Pool Room is the place for you. No need to pack a swimsuit; there's already some, just for you! If you're lucky, you might even find some diving gear! Once you've enjoy a good swim here, you can visit the Bar nearby for some refreshments or, if they're open, visit Hydroponics for a...different idea of paradise. There is no vent. It's a real shame; the only thing better than tropical air is fresh tropical air. The APC for this room is in the northeast corner, by a palm tree. Mind the floor, it's wet and grassy. It's space astroturf, so you won't get muddy shoes or anything, but it's cheap, NanoTrasen space astroturf, so it'll still stick to your shoes and feet. Might want to on a pair of sandals or flippers from the wardrobe. Anyways, there's plenty of things to do in this Pool room by the Chapel besides getting your footwear covered in fake grass. You could take a dip in the pool. Or get a pretend-suntan while wearing pretend sunglasses! Or get a real suntan while still wearing pretend sunglasses! Or, best of all, paint the grass and pool a lovely shade of crimson by absolutely eviscerating Mrs. Muggles. There is no vent. It ruins the fake grass. Don't question it. The APC for this room is in the bottom left corner, by the coffee machine. 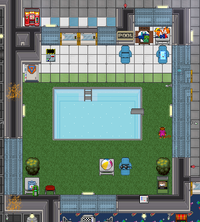 Oshan Laboratory doesn't have a room with the pool. It doesn't need one, because the entire ocean is its pool. It does, however, have a common companion to the pool, a sauna.